Just wanted to say in the 3 years I have been a tenant here at your storage facility I have ALWAYS HAD EXCEPTIONAL CUSTOMER SERVICE ! Bradley has ALWAYS BEEN COURTEOUS AND WONDERFUL! We stored here for 3 years the staff was always attentive and helpful. Offered us water and made sure our needs were taken care of, we will be recommending your business to anyone that may need storage Thank you for making us feel welcome safe and secure. I have been very happy here price is lowest in the area, the manager Bradley is so kind and helpful every time I come to my unit. I can no longer afford to rent the unit however as my husband passed away. Bradley helped me with the move out and was very compationent. Thank you very much for your understanding and great service. Rented a large unit for 5+ years and very happy with service and affordability. Thank You EZY WAY! The manager Bradley is really good with all the people, friendly and courteous. Thank You. Your late fees are decent you don't keep adding more late fees all month. If i was late to begin with I sure won't have the extra late fees adding up. Much appreciated. From my first call to EZY Storage I knew we would be in good hands. Very helpful and friendly! Great place , the staff are great courteous & easy to deal with . i would recommend this place to anyone needing a storage. Great place, nice people and would recommend this place to friends. Its been no problems and I'm happy with it. Everybody is always kind and the sign in board is kept up to date with the knowledge of who's been in before me. I have enjoyed having my items stored at this facility. Thank you very much! We have been with this facility for little over a year and have no complaints. I've been very happy storing my stuff at this location. Anytime I'm there it's very clean and I feel safe accessing my unit. Bradley was very helpful in setting me up when I moved back from out of state. I'm not often there when the office is open but I am never disappointed by the friendliness. I needed to put my stuff into a storage and at first picked Ezy Way because they were close and had good prices. Ive stayed with Ezy Way for the same reasons and because Bradley is one of the best managers at a self storage that I have ever met. They are friendly, nice, very helpful and just all around good guys. You couldn't ask for any better. The Facility is very clean and the staff is awesome! The management at Ezy way storage is the best. Bradley and Steve go above and beyond to make sure you have what you need. I have been with Ezy way for a while and I know I have nothing to worry about , I know my things are safe. I recommend Ezy way to everyone that I know. Found EzyWay and they had the best prices in the area. The manager got me set up and in to the right unit for my needs didnt try to up sale or push any additional sales items on me. He let me know what my options were and I am very happy with the overall experience. Thank You Bradley for great service. Nice guys that run that place over there! The management is very helpful and friendly took care of all my questions and concerns. They have the best prices I could find. I am comfortable knowing that my belongings are safe and secure. I had a great experience, the manager was very friendly and took the time to answer all my questions. I recommend this storage facility to anyone that may need storage, their location is safe clean and they truly are there to help you with all of your storage needs. Though the location was convenient for my needs I did have some dirt and debris in my unit, the manager did come out and replace the door seal when I complained and was attentive to my needs. They were doing improvements new paint and security cameras and the manager let me know that they were working on improvements and repairs throughout the site. The staff was friendly and answered any questions I had right away. The mini storage provided me with all my needs, the managers were very friendly and helpful. I do recommend this facility to anyone that may need storage and should the need arise again I will be renting here again. The price is the best I found, their site is clean and newly painted they also have all new security cameras. The manager was very helpful and friendly. He seams to take his job very seriously and lives on site I am confident that this is a safe and secure self storage. Great friendly staff clean and easy to get to! The staff was very friendly and helpful prices cant be beat. There have been many changes recently New staff and the site has received a make over new paint and new state of the art security surveillance system I know my belongings are in good hands safe and secure! I highly recommend EZY WAY! We have been using EZY Way for years and i have to say that Pam and the new staff really improved this place. Since this new management, what a huge difference! Pam and staff are always helpful, friendly and professional. They actually care about the customers. I would highly recommend EZY Way to anyone that is looking for a good price and a safe place to store their belongings. You can feel confident working with Pam and her staff. This is for staff @ West Luke Ave location. The property is clean, very secure & staff are profession & pleasant to deal with. You won't find any better than this. Excellent staff and facility with fair pricing, clean units and good hours. Management will provide a free lock for you to keep and will offer good discounts for new customers. Ezy Way is the BEST! I rented my unit and got 2 months 1/2 off and then Pam (the manager) was so helpful and when we moved in she even let us stay after the gate was to close so we could finish. The last managers didn't seem to keep up the property and never had ice cold water available! This manager is always picking up trash and making everybody happy! It was a pleasure working with the location manager Pamela Scotti because she was extremely helpful with getting me set up and moved in my storage unit, very professional and pleasant to deal with and was always fast to get back to me whenever I had questions about my unit even when it was reserved before my move in date. 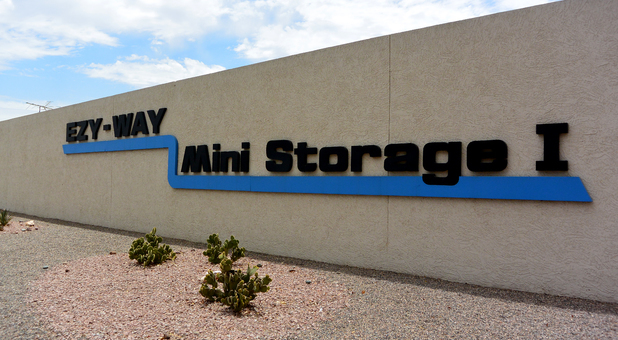 EZY-Way has the best prices on storage units in the Phoenix metropolitan area. I would highly recommend this property because it has great units, but is ran by an amazing property manager. Satisfied with this facility. Decent staff. Decent place to store stuff. I would rent from this place again. Nice staff, well-maintained, clean, and convenient. I would refer this place to my friends. I was pleased with the overall service and friendliness of the staff. I was happy with the location, and the maintenance and upkeep of the property. I would rent from them again in the future. Very happy. Will refer to my friends moving to this area. Very good customer service and very much appreciated. I would rent from them again. Happy with service, and how the maintenance and upkeep is done on the property, my unit was cleaned before I moved in, and the property is kept clean. It was easy to get to, and I would refer them to my friends. I would definitely rent here again. The place was good, but it needs more maintenance and more advertising. Decent facility but is old and needs more upkeep. Staff is really friendly, my unit had stuff on ceiling that needed more cleaning, but I would rent from this place again. Staff was friendly and service was great! Facility is well maintained and units were clean before moving in. Convenient and easy to get too. I would definitely rent from them again! Great place to rent a storage, nice and friendly staff, clean units, they keep it clean. I would rent with them again if I needed storage. Found them on the internet, user-friendly website, the staff was friendly and gave great service, they keep the property nice, my unit was cleaned and ready when I leased my unit, convenient location, and I would definitely rent from them in the future if I need a storage unit again. Latoya, the new manager was much nicer than the man that rented the space to me. I was happy to see him gone. Nice and friendly staff, they keep the facility clean, they clean the units before renting them. Great service and friendly staff, property kept up well, clean storage units, clean property, easy and convenient to get to. Happy with facility - friendly staff - decently kept - clean storage units - easy for me to get to. Nice and friendly staff. Clean & well-kept. Close to my business. Rented with them many times, and I would definitely rent from them again. Friendly staff, great service, well-maintained, clean property and storage , convenient for me to store my items. Quick, easy and painless. The lady that manages is VERY helpful. Way too satrisfactory when hard times catch me, I will be asking for your service. Nice friendly managers, well kept site. May be back. very cheap, great location! family pays over the phone. never had a problem with there services. very great people.